More information concerning the closing of the National Archive (NARA) Northeast Region New York Branch is received from correspondent, Roger D. Joslyn, FASG. Those of you that have had the pleasure of using the excellent facility and holdings of the New York City branch on Varick Street will want to know about the changes being made. It appears as though the downsizing will affect the collections as they move the facility over to the Customs House in lower Manhattan. “I hope those of you who are interested in the future of the National Archives in New York City and access to its research materials will be able to attend one of two meetings this Tuesday at NARA-NYC, 201 Varick Street, 12th floor, Manhattan, at 10:30 AM or 5:30 PM (or come to both sessions!). In addition to information about the new location in the Customs House, there will be discussion about which textual records, microforms, and books have been identified to go to the new facility, which will be sent to storage, and which will be offered to local libraries/repositories (the latter concerns only microforms and books). This list of research materials is still in the “development” stage, so your interest in, concern for, and comments about the materials is important. Check out the previous letters from Roger regarding this matter. Upstate New York Genealogy readers please note, it looks like we are losing another extremely valuable local research facility. The National Archives–Northeast Region in Manhattan has been our nearest location to access NARA record holdings. Roger D. Joslyn, FASG, sent me this letter and requested that we share it here on UNYG.com/blog in the hopes of creating some public influence on the situation. Roger makes a point to say that none of this information is truly “official” yet but it has been gleaned from various sources that he has. We may be losing the National Archives–Northeast Region as a research facility. Perhaps we can save it and not have New York lose yet another important repository for our research. Here is the supposed plan, told recently to Stuart Stahl by Diane LeBlanc, NARA’s Regional Administrator in Waltham, Massachusetts, for him to pass the word. So, there is nothing “official” beyond this, and nothing in writing for dissemination. •NARA-NYC will move in approximately eighteen months to about 5000 square feet over two floors in the Customs House. •Only about twenty percent of the current collection at 201 Varick Street, textual and microform (not specifically identified to Stuart), will go to the new location in the Customs House. All or most textual material will go to a storage facility in northeast Philadelphia and will have to be transported to New York City for researchers, as off-site textual material in Lee Summit, Missouri, is now. •Among the textual material to be retained in the new space will be the federal court naturalization petitions not microfilmed and the federal court records docket books, but it is not clear if the originals of microfilmed naturalizations will be retained. •“Non-regional” microfilm will go to NARA-Pittsfield. •Certifications of records on microfilm will have to be requested from Pittsfield. •The volunteer staff will be abolished or reduced, since there will no longer be textual records for them to arrange, index, and so forth. •The new space will be primarily for visitors to see exhibits. There will be a few computers and, apparently, some microfilm readers and reader-printers. 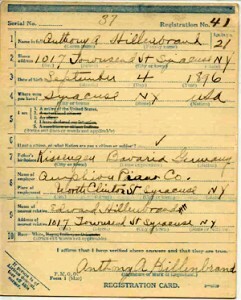 •The microfiche indexes of New York State vital records will evidently go to the new space, together with associated printed material and microfiche readers. •Nothing has been mentioned about the fate of NARA-NYC’s library, including published census indexes and so forth. •Some of us had been led to believe there would be invitations to some of us “regular” users to help NARA staff know our needs and plan the space and collection for the Customs House. It would seem now that, while there may be a “public meeting,” it will only be to tell us NARA’s plans—too late for any changes. There is probably more that is or will be of concern to all or most of us. When the move of NARA-NYC became more certain a month or so ago, I had a telephone conversation with Diane. She seemed very excited about the increased display space that NARA will have in the Customs House and explained the need to reduce the research collection because there will not be room. She also mentioned that the lower number of patrons using NARA these days justified the scaling down of the research facility. She did not seem to be concerned about the need many of us have for certification of records for legal matters, or that the microfilm and original textual records were still necessary even though there is much online. She was quite proud to tell me that NARA-Waltham had given all of its “non-regional” microfilm to a library in Plano, Texas. Guess who got the better deal there! Ironically, while New York City is scaling down, the Waltham facility is being expanded!! I do not think I need to state the obvious to all you seasoned and knowledgeable researchers about the huge loss to us if all the plans noted above are correct and go through. I know I use microfilm of the Federal Census at least once a week in order find what I cannot online or clarify what I do find online, one problem being the annotations that obscure names on the 1900 Census. This is but one example. 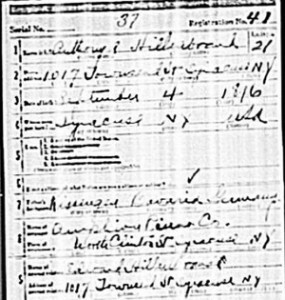 I am sure you have all found census pages missed by Ancestry, Heritage Quest, Footnote, or “front material” and other pieces not scanned from the microfilm that someone evidently decided we did not need. Sorry! One more example: What about the original ships’ passenger lists, especially the ones where the often abbreviated copy is what is on the NARA film? What will become of these? Who in Pittsfield will make “my” kind of decision about the best copy to be certified for the court? In the always-tight time breathing down our necks for court cases, what will Pittsfield’s turn-around time be? Will there be added costs since we can no longer get the certifications locally? Will Pittsfield staff make “groupings” of certified records that we often get here to hold down costs? Personally, while I have enjoyed many of the exhibits at NARA-NYC, I rarely see anyone coming to specifically look at them, and even those who come to do research seem not to pause for a few minutes of viewing. And it has always been my understanding that one of the great things about our National Archives is its wealth of material for scholarly research. Yes, personal visits are down, but we all know what the majority of those who rely strictly on the magic box are missing. And I do not see much effort by NARA to help educate the unwashed about what is there that cannot be found online. The very upsetting plan seems analogous to a library tossing certain books because no one has taken them off the shelves over the last couple of years. So, who wants to organize the car-pooling to Pittsfield and Philadelphia? No? Then we should organize a group effort to let our concerns be known. Genealogists have been successful in the past in changing the direction of bad thinking at NARA. Some examples come to mind: When President Reagan proposed John T. Agresto as Archivist of the United States and the genealogical and historical communities formed a loud “No!” to the inappropriateness of the candidate; and when Archivist John Carlin planned to ship huge amounts of NARA material from the regions to cold storage (and some of you were on hand to give your two-cents when he came to New York City). Another example is the great effort genealogists lent to getting NARA away from GSA’s thumb. Are there others out there, including folks you know in the historical community, whom we should encourage to get involved? I know after the G&B mess, many of you may not want to devote the time and energy it may take to make a difference, but I look forward to hearing from those who are concerned and want to be involved. Then we can plan something together.